When my parents and I lived in 53206 during the early 1970s, Milwaukee was considered one of the best places in the nation for African-Americans. The city of Milwaukee was an economic power, attracting workers from the South. The nation was at its post-World War II industrial peak. More than 85 percent of black men between 25 and 54 in the Milwaukee metro area had jobs, with four in 10 black adults working in manufacturing — the highest percentage in the nation, according to a 2007 University of Wisconsin-Milwaukee study. 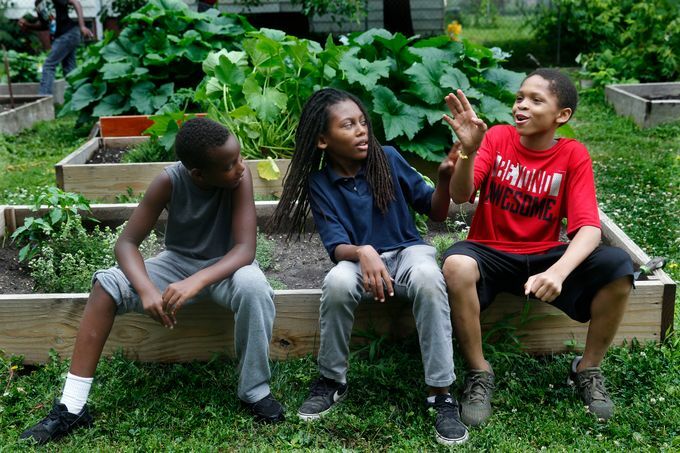 In my 2018 National Fellowship project, “Cultivating a Community,” I took a look at what happened to my old neighborhood of 53206 by zeroing in on how young people are impacted by trauma. While working on the garden project I learned about residents of the community. I talked with June Thomas, who was born and raised in 53206. At 48 years old, Thomas has been exposed to lots of trauma, from seeing people shot and stabbed, to losing one of his best friends to violence last summer. He volunteers in the garden to help kids and it’s also an opportunity for him to heal. I kept a personal journal of what I learned and used that to tell the story of 53206 through my eyes. I told the story of “Lil Obama,” a young man who said the program saved him. Now he has political aspirations when he grows up. I also shared the story of a couple addressing youth and adult trauma through writing, poetry and exercises. Lastly, I shared the story of incoming Sheriff Earnell Lucas, who came to the garden one day to support Ellis. He ended up sharing his story of overcoming trauma with the youth. He was shot in the face as a police officer after only being on the force for two years. He talked about how just seeing a gun on TV or hearing gunshots during a film would set off triggers. When he went back to work four months later, he received no treatment. He said that would not happen today.